All 3 of my AP SIs have concluded. I had a great time at all 3 stops and look forward to doing a few summer institutes again next year. This year, I started each SI with Scratch and Jeroo on the first day and then moved on to GridWorld and lots of Java. I spent considerable time on arrays and ArrayLists as those topics constitute a huge part of the exam. We worked with arrays and lists using graphics, games, and cross-curricular focused projects. Time was spent discussing ways to show students how important Computer Science skills all to other disciplines and to students considering a degree other than Computer Science. We read articles each day, like the ones I post here on this blog and discussed the relevance of talking about articles in class. I just received a link to a great article about Stanford Computer Science and the changes they have made. It is a great article and makes me feel great about many of the changes I have made to my curriculum over the last 3 or 4 years. This entry was posted in Uncategorized and tagged ap computer science, Careers, Games, GridWorld on July 4, 2012 by Stacey Armstrong. Well, another AP exam has come and gone. The 2012 exam is now in the rear view mirror. This year’s exam is proof that you will never get the Bugs out of your code no matter how hard you try. Having tortured my students with over 600 practice M/C questions ( Moodle makes this sooooo easy ) and volumes of Free Response questions, I felt the need to blog a bit about the comments I heard after the exam ( more than 48 hours after the exam ). It never fails that after spending hours working to help students prepare that there will be handful of comments that upon hearing make you laugh and cry at the same time. I have embellished these just a bit to protect the innocent and to slightly increase the humor factor. These comments are in decreasing order of humor or pain – however you quantify them. Please do your best to infer the extreme level of sarcasm in my [anecdotal bracketed] mental responses. DISCLAIMER – All comments were heard 48 hours after the exam. I hope you enjoy this humorous post and also hope you have a great summer! Enjoy the AP Reading if you are going and look me up if you need a Great AP Summer Institute! This entry was posted in Uncategorized and tagged ap computer science, GridWorld on May 14, 2012 by Stacey Armstrong. This is really cool! It makes sense to use a game to solve a problem as problem-solving is a essential part of playing any game. I have made several posts about using games to teach Computer Science and the benefits. I have been using basic games, complex games, and the theory and logic behind them to teach Computer Science and problem-solving concepts in my classes for a long time. Games, like bowling, are just good family fun. Games are interesting and get students excited and they require serious thought and planning to build. 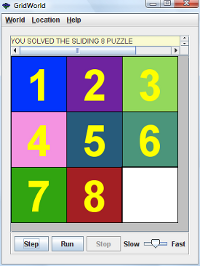 I have my students build a sliding puzzle project in GridWorld and use it as a stepping stone to talk about using priority queues and the A* algorithm to write an automated solver. The A* algorithm is a fun algorithm to learn and can be used for lots of different games and such. Yes, I did just use algorithm and fun in the same sentence and meant to do it! The games are the hook and the rest of the concepts just fall into place. This entry was posted in Uncategorized and tagged Careers, Games, Gaming, GridWorld on August 6, 2010 by Stacey Armstrong.